Lightweight polyester.“Generous size for full client coverage.“Attached belt.“Contrasting trim. Largest client wrap available.“Finest poly/cotton blend.“Wide contrasting trim.“Attached belt. Crinkle nylon.“Generous size for full client coverage.“Attached belt.“Snap closure.“Machine washable. 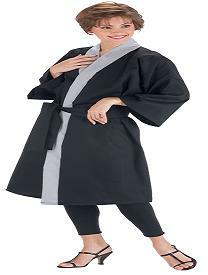 Poly/cotton blend.“Generous size for full client coverage.“Attached belt.“Stylish black trim.